A crack has appeared in the Guajataca Dam, threatening up to 70,000 residents of three towns downstream, officials said. SAN JUAN, PUERTO RICO — Tens of thousands of residents in northwestern Puerto Rico were ordered to evacuate Friday amid fears that a dam holding back a large inland lake was in imminent danger of failing because of damage from Hurricane Maria’s floodwaters. Officials worried that as many as 70,000 people could be in the path of a massive amount of rushing water in the event the Guajataca Dam releases into the Guajataca River, which flows north through low-lying coastal communities and empties into the ocean. The dam suffered a “fissure,” Puerto Rico Gov. Ricardo Rosselló said in a news conference Friday afternoon. Residents in the municipalities of Quebradillas, Isabela and part of San Sebastian could be affected if the dam collapses, he said, and it could be a catastrophic event. Abner Gomez, executive director of Puerto Rico’s emergency management agency, said in an interview late Friday that the dam’s gates suffered mechanical damage during the storm, making it impossible for them to open and let out normal water currents. Officials worry that could cause the dam to spill over. The urgent situation Friday came more than 48 hours after Hurricane Maria slammed into Puerto Rico’s southeastern coast as the most powerful storm to strike the island in more than 80 years. It was a reminder that Maria’s impact on Puerto Rico is far from over; officials still have little sense of the scope of the damage as a communications and power blackout continued to affect nearly everyone in the U.S. territory. Gomez characterized Maria as “one of the greatest natural disasters” in recent U.S. history, comparing it to Hurricanes Katrina and Sandy. The destruction in some parts of the island “looked more like a tornado than a hurricane,” he said. Rescue and recovery could take months, he said, and a “return to normalcy” could take at least a year. Authorities on Friday reported six deaths across the island. Three of the fatalities occurred in the municipality of Utuado as a result of mudslides, Puerto Rico’s public safety department said in a statement. 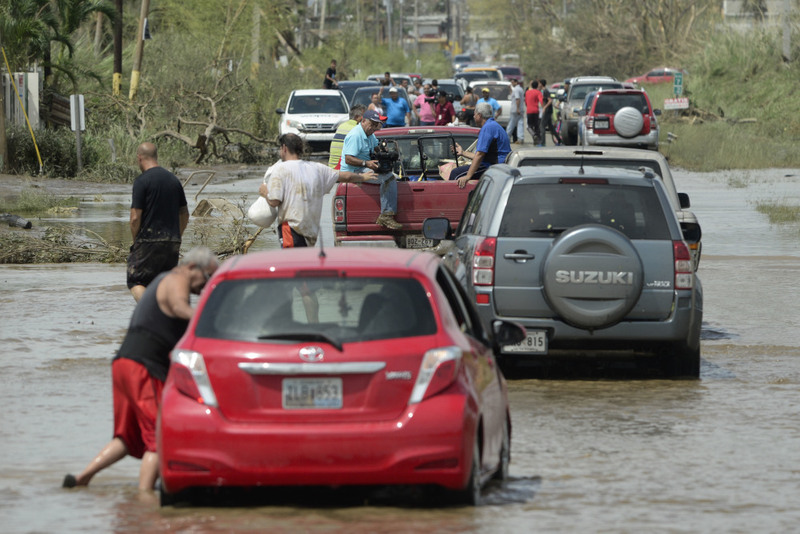 Two others died in flooding in Toa Baja, and one other person died in Bayamón when a panel struck him in the head. More deaths are likely to be reported in coming days as search-and-rescue crews reach previously inaccessible areas, officials said. “We are aware of other reports of fatalities that have transpired by unofficial means, but we cannot confirm them,” said Héctor Pesquera, secretary of the public safety department. Though damage assessments have been nearly impossible, early reports reveal an island ravaged by Maria’s high winds and torrential rains, with roofs peeled open like tin cans, neighborhoods waterlogged, and trees that were lush just days ago now completely stripped bare of leaves. The hurricane plowed through the entire 100-mile island, with the eye tracking diagonally from the southeast to the northwest. The lack of communications has isolated rural areas of the island. Just 15 percent of Puerto Rico’s communication towers are working, and some transmission towers have collapsed. Up to 85 percent of the island’s fiber cables are damaged. Power remains completely out across the island, and just 25 percent of it has water service. Shock has given way to frayed nerves as officials warned that it could be months before power is restored to some areas, and there is no indication of when communications infrastructure will be fixed. In San Juan, the capital, streets were choked with traffic as people tried to find loved ones and spent hours waiting in line for gas. The De La Cruz family could not find fuel Thursday. On Friday morning they waited in line for six hours at one of the open stations here, and there were still 20 cars in front of them. Gabriel De La Cruz and his wife, Luisa, took turns fanning their 1-year-old son, Ismael, who sat sweating in the hot car, wearing only a diaper. “This is all we have,” De La Cruz, 30, said of the car. They lost their home and all their belongings. Residents searching for loved ones in remote areas met downed trees, power lines and other debris. News was particularly scarce from the southern and central parts of the island, as well the tiny island of Vieques to the east. 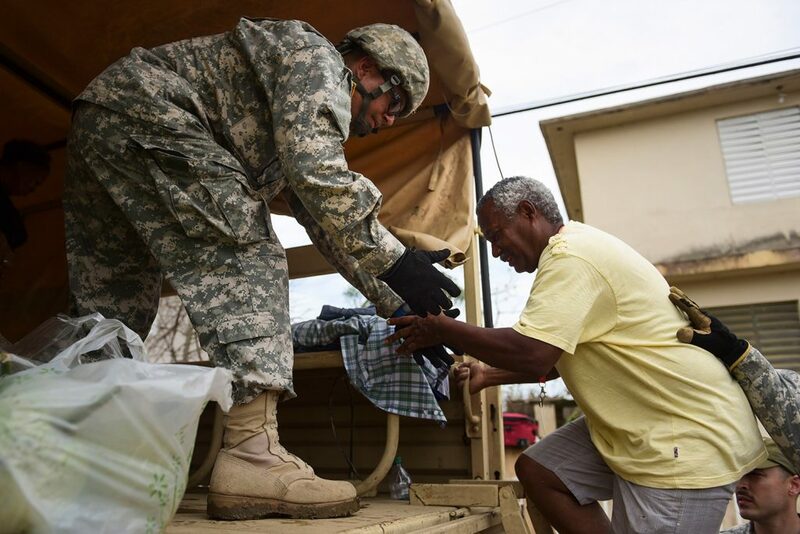 Puerto Rico, with 3.5 million U.S. citizens, also is facing a crisis due to geography: It is an island dependent on air and sea for supplies and help. The immediate response that occurred after Hurricane Harvey in Houston, where volunteers from Louisiana headed in during the storm, or after Hurricane Irma in Florida, where utility trucks were pre-positioned to assist, is impossible here. Photos taken from a helicopter surveying the damage in the southeastern part of the island, encompassing an area that on a good day would be a two-hour drive from San Juan, show entire neighborhoods engulfed in murky water. Tops of buildings were sliced open, their rooms visible as if in a dollhouse. A building in a coastal luxury resort, once with enviable ocean views, was now partially floating over open air as rocks and mud crumbled under one corner and fell into the sea. Windmills broke and shattered, and solar panels shone like mirrors. The enormity of what the country had just been through – and what was yet to come – appeared to be sinking in for many people, including those who considered themselves hurricane-hardened. Ramirez lives in a small three-story house near the waterfront on Calle San Miguel. His house, a sturdy cinder-block structure, was built 17 years ago and did not suffer much structural damage. But rain and ocean water found its way into every room. He expects not to have power for months. Leaning against the wall of his carport in coastal Loiza, Jorge Diaz, 72, was waiting for the airport to open, so he can escape to relatives in Florida because he can’t imagine going months without electricity and water. One block down and across the street, Lizmarie Bultron, 39, trudged through calf-high water to exit her home, about a block from the beach.